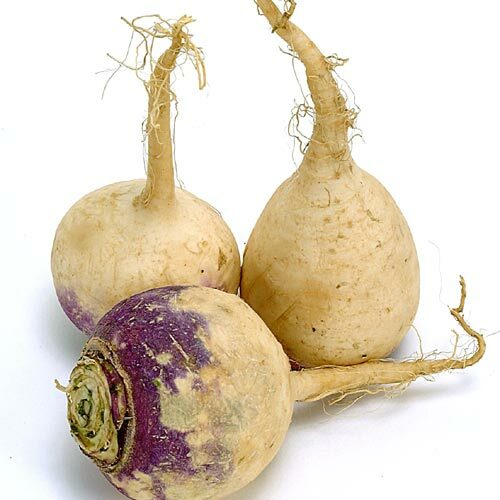 Rutabagas are commonly known as table turnips or swedes. They have longer necks; the leaves have more bloom and are bluish in color; and they require about one month longer to develop than turnips. In northern New England, rutabagas are much more popular than turnips. If planted early in the spring, rutabaga will be of poor quality (woody and tough). For best quality, plant from mid-June to mid-July in northern to southern New England, respectively, so that harvest occurs in the cool weather of fall after a few light frosts. Turnip is a fresh market root vegetable that reaches maturity about 50 to 70 days after planting. Turnip leaves (eaten as greens) are usually pubescent and light to medium green in color. Turnip roots generally have little or no neck and a distinct tap root. Best quality results when the crop reaches edible size under moderately cool temperatures.